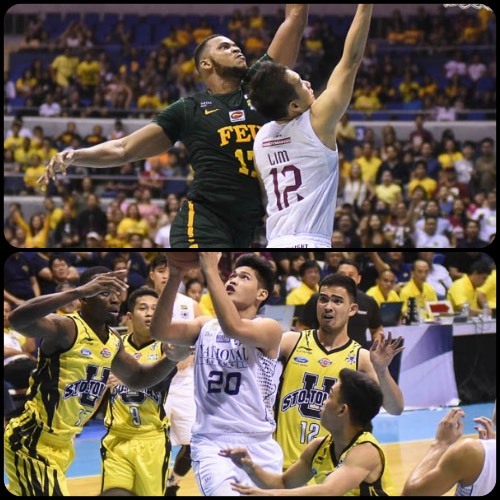 Hoop Nut #UAAP79 FEU NU UAAP UP UST #UAAP79 Roundup: Tamaraws slip past Maroons and Bulldogs outlast Tigers on Day 10! #UAAP79 Roundup: Tamaraws slip past Maroons and Bulldogs outlast Tigers on Day 10! Images from Richard Esguerra/ABSCBN Sports. Day 10 saw the FEU Tamaraws escape the upset axe against the UP Fighting Maroons, while the NU Bulldogs scrambled to beat the UST Growling Tigers. The FEU Tamaraws needed to fend off a gutsy effort by the UP Fighting Maroons to notch a 51-49 win in UAAP Season 79 action Sunday at SMART-Araneta Coliseum. 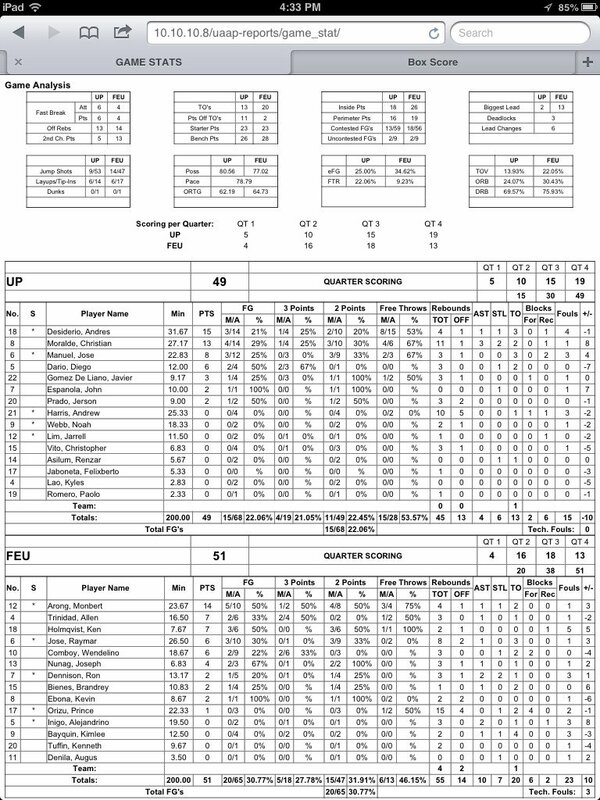 Monbert Arong scored 14 points and made crucial baskets down the stretch to help FEU (3-2) pick up its second straight win. Prince Orizu also grabbed 15 boards and four blocks, two of which came in the dying seconds to prevent UP from pulling off an upset. Both teams struggled to shoot the ball in the first half. First quarter ended with UP and FEU combining for a measly total of nine points–five for the Fighting Maroons and four for the Tamaraws. Paul Desiderio scored 15 points to lead the Fighting Maroons in the losing effort. Monbert Arong (FEU) - 14pts, 4rebs, 1ast, 1stl, 1 triple, 5/10 FGs. Dave Moralde (UP) - 13pts, 11rebs, 3asts, 2stls, 1 triple. 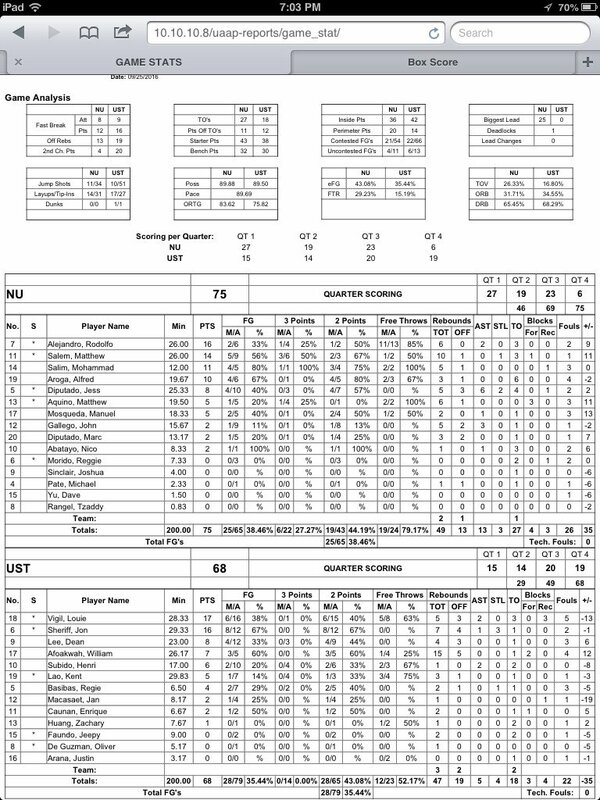 The NU Bulldogs went quiet in the fourth quarter but their big cushion proved to be enough as they escaped with a 75-68 victory over UST for a UAAP Season 79 victory on Sunday at the SMART-Araneta Coliseum. NU was held scoreless for the first seven minutes of the final period and mustered only six the entire quarter but still picked up the win to improve to join a four-way logjam for second place at 3-2. J-Jay Alejandro led NU with 16 points, including an impressive 11-for-13 clip from the free throw line while Matthew Salem posted a double-double with 14 points and 10 rebounds. Med Salim chipped in with 11 markers in just 12 minutes of play while Alfred Aroga scored nine of his 10 points in a big third quarter to help the Bulldogs’ cause. Matt Salem (NU) - 14pts, 10rebs, 1stl, 1blk, 3 triples, 5/9 FGs. Jon Sheriff (UST) - 16pts, 7rebs, 1ast, 3stls, 8/12 FGs.